Research Chairs are interface points between the academic world and the professional world which contribute to the production of expert knowledge to address specific issues met by partner businesses. A Research Chair is a meeting point where expertise is exchanged between professionals and the School’s lecturer-researchers. This partnership between the worlds of business and research aims at developing new knowledge and understanding and improving managerial practices in a changing environment. 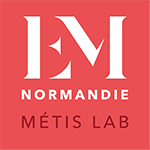 EM Normandie puts its teams of lecturer-researchers at the disposal of its sponsoring partners to work on common issues in the Management Sciences field. In 2018, the School is opening two research chairs, one focused on Digital Transformation Management and the other on New Entrepreneurial Models in Agriculture. Two more projects are being considered, on Horse Breeding Industry Management and on Territory Risks and Space Ergonomics. As a growth, productivity and competitiveness vector for both companies and territories, the Digital Economy is currently attracting a lot of attention. The existence of the TES Pole of Competitiveness, which is a reference with regard to innovation in digital high-tech and EM Normandie's partner on various projects, is an additional asset for developing the digital sector in our territory. The use of Information and Communication Technologies (ICTs) among professionals has developed quickly: organisational structures, occupations and also relationships with stakeholders have been thoroughly modified. For the digital economy to remain synonymous with performance and competitiveness, it seems important to rethink global strategies, business models and work organisation and also customer relationships within companies. Seize new opportunities that arise. Therefore,EM Normandie has approached several local players and three sponsors have decided to support the development of a Digital Transformation Chair: Crédit Agricole Normandie, Chalus Chegaray & CIE,including its subsidiaries Colloquium and Cavas, and the PTBG Group. The inauguration of the Digital Transformation Management Chair is scheduled on 25th September 2018 at EM Normandie.